Advertising Fivers Dog cookies. This cookie jar is 8 1/4" tall, 5 1/4" wide & 6 1/2" deep. Marked "Walter Kendall, Registered Fiver on the bottom. 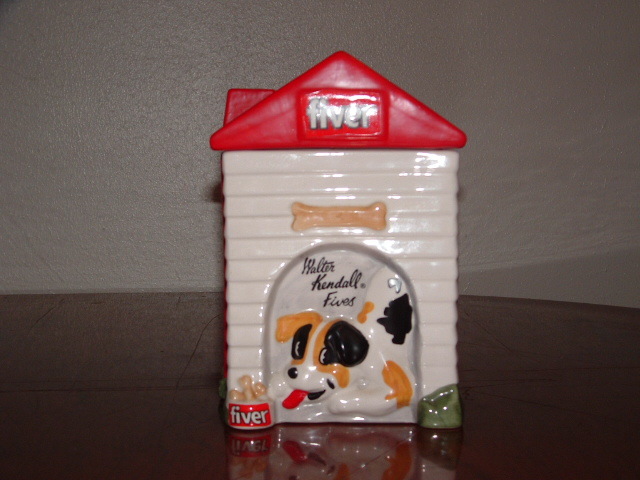 Fiver is written on the roof of the doghouse with Walter Kendall Fivers signed on the front. This jar is in excellent condition and ready for your advertising collection.